Grant Boosts Business & Technology Program for School of Management. A $5 million grant from the Robert D. and Marcia H. Randall Charitable Trust will expand Concordia University-Portland School of Management’s focus on an innovative business education and technology program, establishing the Robert D. Randall Endowed Chair for Business and Technology. This is Concordia University-Portland’s largest single philanthropic gift in the school’s nearly 114-year history. The focus for the business & technology program is driven by the unique makeup of our regional economy, one fueled by homegrown businesses as well as global enterprises. A new clinical model and technology curriculum will be co-designed with regional business leaders working in small and large businesses alike, startups, and the growing tech sector. Engaging students early and often in a variety of clinical experiences through a co-op approach, with a strong technology emphasis, will prepare future leaders who are able to help businesses respond to ever-increasing economic and technological change. The $5 million grant will kick off a University campaign to raise an additional $1.25 million. The university’s business program will be known as the Randall Fellows Clinical Program for Business and Technology. 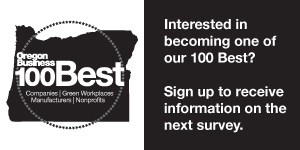 The Concordia MBA was recently listed among the top three on Oregon Business magazine’s 2019 Powerlist. Concordia provides multiple undergraduate business degrees, concentrations, and a master of business administration (MBA). Under Dean Cowing’s leadership the past four years, Concordia University-Portland’s School of Management continues to grow, significantly expanding student enrollments in the undergraduate and MBA degree programs. In partnership with Tech Academy, the School of Management recently added a minor in computer information systems. The program is nationally recognized by the Accreditation Council for Business Schools and Programs (ACBSP). ABOUT CONCORDIA UNIVERSITY - Concordia University-Portland is Oregon’s largest private, nonprofit university. Located in northeast Portland, Ore., Concordia is a Lutheran, liberal arts university with a mission of preparing leaders for the transformation of society. Founded in 1905, Concordia Portland serves approximately 6,000 students on its campuses and online, through its College of Education, College of Health & Human Services, School of Management, College of Arts & Sciences, and Concordia University School of Law in Boise, Idaho. For more about Concordia University, visit www.cu-portland.edu and www.concordialaw.com.